For a business that its manager says is built on mercy and compassion, Catholic Trade Manila is not doing badly at all. Established in 1924 by the Society of the Divine Word (SVD), a Catholic missionary congregation of men, Catholic Trade Manila in Tayuman, Manila is the go-to store for religious items such as crucifixes, chalices, religious frames and other items for use in Catholic churches as well as homes. It is located in the middle of what could be called the Divisoria for religious goods as it is surrounded by over a dozen stores selling almost the same items. “We offer almost any Church good you need—from chalices to novena booklets,” says Fr. 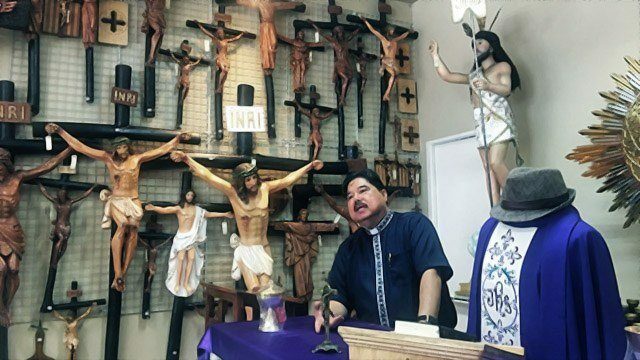 Carlos Maria De Guzman Jr., an SVD missionary and general manager of CTM Inc.
Around 90 percent of the items inside the store are locally made, especially the statues. Most of them come from workshops in Paete, Laguna and some towns in Pampanga. What sets the store apart from the rest in the area is its extensive inventory that includes everything from small crucifixes for the home to giant ones for churches. It even sells huge brass bells for church towers. Ahead of the Holy Week, Catholic Trade was doing brisk business as churches in Metro Manila and surrounding areas stock up on items for the masses and other events in connection with Lent. Some of the most in-demand goods during the season are incense and votive candles for the altar and prints of the Passion of the Christ prayers for the churchgoers. “There are different best-sellers per season but these are some of the items that run out usually during Lent,” explains De Guzman. 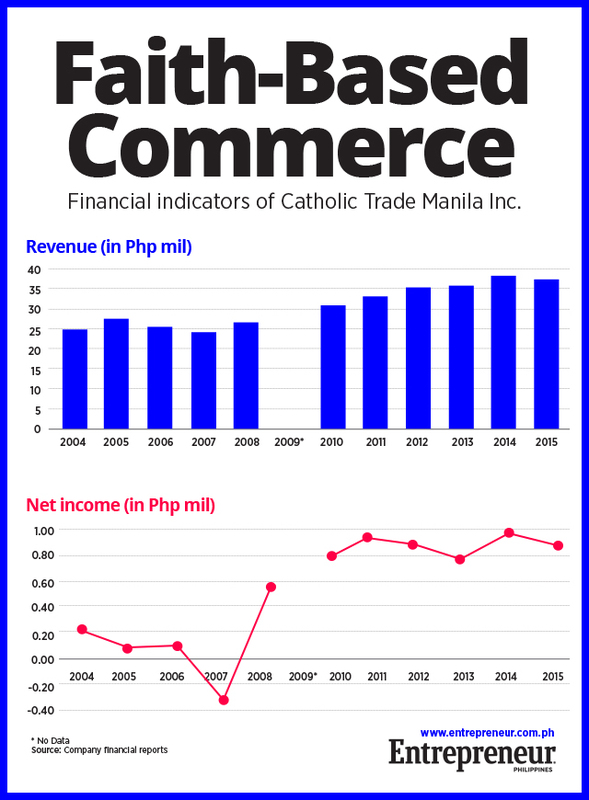 Perhaps that explains why Catholic Trade Manila’s net income had been falling between 2004 and 2006 and turned into a loss in 2007. Revenues barely rose during the period. When De Guzman was assigned general manager of the company in 2008, after serving his residency in Chicago in the United States, he immediately moved to turn things around. With a Master’s in Business Administration (MBA) degree from the University of California in Los Angeles, De Guzman was well placed to improve the company’s fortunes. Fr. 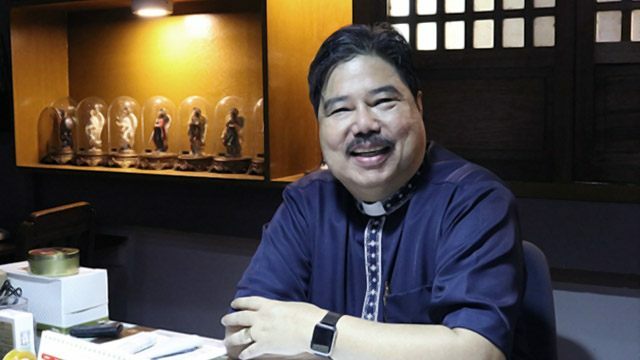 Carlos Maria De Guzman Jr., is an SVD missionary and general manager of CTM Inc.
“The SVD is now recognizing the need for priests to study such especially for better management in the urban areas we go to. Right now, there are more priests having their MBA in the US,” he adds, explaining why he got a graduate degree in business. Thus, Malaysian tourists or Chinese travelers on a holiday trip are not an uncommon sight inside the store though many of them are probably not Catholics. Apart from tapping the tourist market, De Guzman also began to ship goods to other countries for the first time ever. “Just last year we shipped around Php2.5 million-worth of Church items to Papua New Guinea. We’ve become an official supplier for churches there,” he reveals. Most of the company’s international clients come from the Pacific islands, he adds. Locally, Catholic Trade is also expanding its footprint by putting up more branches in different parts of the country. Three years ago, De Guzman opened a branch in Puerto Princesa in Palawan to serve as the main supplier in the area. 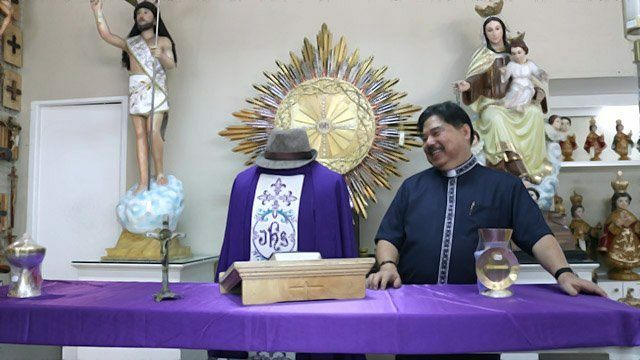 “It now serves as the main supplier for the local diocese there, as well as for those in Northern Palawan or even Roxas (municipality),” he adds. Currently, the company has a total of three branches, with another one in Farmer’s Market in Cubao in Quezon City to serve northern Metro Manila. The general manager, however, still aspires to open another branch in Pampanga soon to cater to those in Central Luzon. These moves helped the company post some robust financial numbers in the last six years. Profits grew steadily from only Php730,000 in 2010 to Php870,000 in 2015 while revenues climbed from Php30.7 million to Php37.3 million during the same period. When asked how the store managed to improve its financial performance in recent years, De Guzman mainly credits the store’s employees. “I think it all boils down to customer service. I always tell our employees to treat every customer with respect and always, always be polite,” he says.